Satan has taken over the CPUs! Thought I share a picture of these. 32 MB each, with Parity (36-bit), 50ns!! Made in 1999, quite late for PS/2 RAM. Will come handy for overclocking. bjwil1991 wrote: @ chose007 The card at the top, is that an Aztech Sound Galaxy BX? Back side of this card said nothing more ... maybe specialist like Batyra can tell you more. Found info about the card: http://www.amoretro.de/2012/05/aztech-s ... 8-bit.html It's in Dutch, however. That Aztech card is basically a Sound Blaster 2.0 clone. Just set the jumpers and the Set Blaster statement in Autoexec.bat and away you go. A small 8-bit sound card from Aztech, classically held with rotary volume control, joystick port, and mic and line input. Incidentally, the card is based on the power-saving version of the Yamaha OPL2 chip, the YM3812-F, which is the size of a conventional OPL3 (YMF-262). The required resource settings are made directly by jumper. The card is a highly compatible clone of Creative Labs' sound blaster, making it ideal for the old classics. With the Yamaha OPL2 (100% AdLib compatible) the FM sound sounds very nice, here expects the genuine sound. Music and also wavesamples are typically played in mono. The connoisseur might wonder about the board color: it is an Aztech card that was made for an (unknown) OEM customer. The original FCC ID (bottom left) was hand painted with green paint. It is: 138-SGBX21. Cyrix200+ wrote: That's German, not Dutch! This below..... Wanted one since I saw the first in 1988. And now the 30 year old girl is mine.... The "original" and best. Google's spell checker never likes me. brostenen wrote: This below..... Wanted one since I saw the first in 1988. And... I just bought an replacement power supply for my Commodore64. They are not cheap for what they are, I just don't want my 64 to burn from a power surge. Better pay a little more in this case. The 500 and this PSU, are only possible, because I sold a vintage K6-3 Voodoo2-SLI/AWE64-Gold machine today. It was just sitting there, and doing nothing at all. So I found a collector that really want to use the machine. You know... One of those that actually USED it, when it was new stuff. Like... One of those that were teenager in 98. He was so happy to be able to buy locally, and yes I got some money made from it. The absolute best part of it all, was that I sold it to someone that was nearly extatic about getting such a computer. Was all worth it. And I was happy that it did not just end up at someone that would use it and then forget about it. Kamerat wrote: Would be interesting to se how the Crusoe performs under DOS (and Windows). Not very well per MHz, but if you measure per Watt it's a different story. Best performance per Watt until the introduction of the Pentium M (which was what killed Transmeta stone dead). Last week I also got my hands on a marginally faster 733MHz Crusoe system (see a few pages back) - basically on a miniITX motherboard, so if there's benchmarking to be done we can compare crazy sub notebook optimalisations vs a more normal config. Nonetheless I suspect my K6-3+ will beat the pants off it (if I ever receive my SS7 motherboard that is...). Downside of my system is no HW sound chip. It's VIA AC'97, so maybe SB legacy support (haven't checked in BIOS yet), but AC'97 runs of the CPU, so even if it does work, it's going to slow down everything to the point that 533MHz Vaio might outperform it in games with sound enabled. 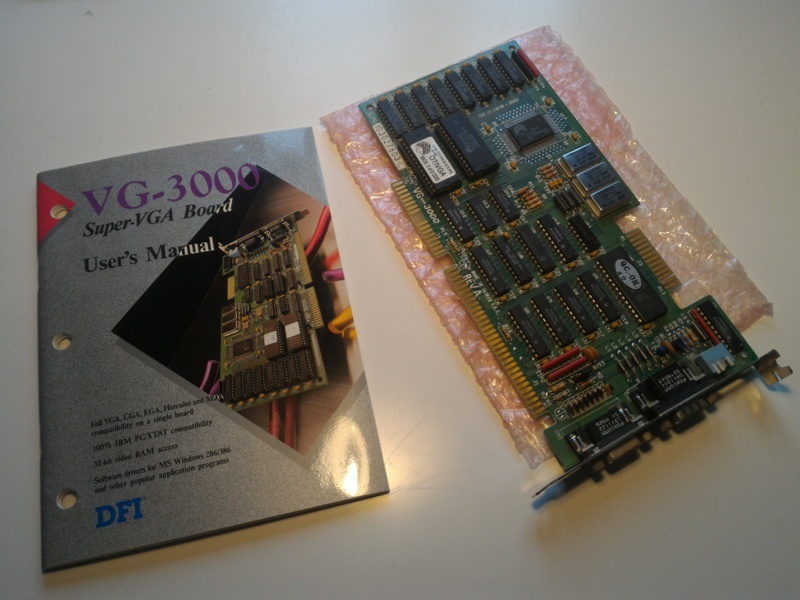 A DFI VG-3000 16b ISA VGA card with Oak OTI037C chip, dual DB15 and DB9 connectors, 8b ISA support, backward compatibility all the way down - EGA/CGA/Hercules/MDA. Oh, and a nearly pristine manual. Only thing missing is the driver floppy. As for the VAIO, it actually has the 600Mhz Crusoe. I am expecting It to perform at about the speed of a Pentium III running around 425Mhz if the claims on the Wiki of a 700Mhz giving about the same performance as a PIII-500. Guessing that is only in certain situations though when looking at the VIA C3 comparison. The screwy thing about the Sony stuff is that they use two totally different model numbers for everything.. which makes it extremely hard to find information if you don't know the marketing model number. Got a whole bunch of stuff from a guy I met on another IT forum. He was cleaning out the cellar for a move, and was gonna throw it all away. Asked nicely if he would consider sending it to me instead, if I covered shipping and added a symbolic sum to that. The package arrived two days ago, and tonight I've sorted it all. - A-trend ATC-2000, a socket 7 mobo with a CR2032 battery instead of one of those pesky RTC modules. - ASRock 4CoreDual-SATA2 mobo (not on the pic, already in a new setup). - 4 x 32 MB 60ns 72-pin EDO RAM (in the ATC-2000 mobo). - 4 x 1GB Corsair Dominator PC2-8500 DDR sticks. - A few pairs of 256MB PC133 SDR sticks. - Core i3 4150 (the newest CPU I own, my main rig got a 3770k ). - Core2duo E6600, one of the better 65nm dual core CPUs. kaputnik wrote: if I covered shipping and added a symbolic sum to that. So typically scandinavian.... Usually it is two bottle's of redwine or 3 bottles of cola or something here in DK. Great haul by the way. But typically Scandinavian? Don't people do this kind of deals all over the world? Ah, the infamous Media bus. 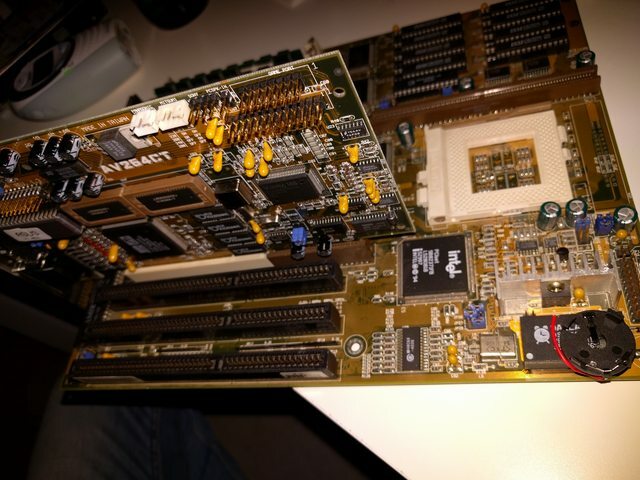 That probably wasn't popular back then, but sure did have ISA and PCI combination for the best of both worlds. Audio and VGA on one card is amazing, no doubt.